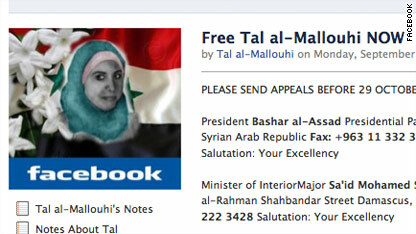 Tal al-Mallouhi's supporters have created Facebook pages demanding her release. A teen blogger who had been held for nine months in Syria’s Duma women’s prison has been charged with espionage, according to several media outlets. Syrian Intelligence Services summoned Tal al-Mallouhi, 19, in December to interrogate her about her blog, which contains poetry and social commentary on local and Arab affairs, the Syrian Human Rights Committee reported. “Thereafter she was arrested and has not returned to her family since, nor do they know her place of detention. Shortly afterwards, intelligence apparatus went to her home and seized her personal computer,” the committee reported in August. The New York-based Human Rights Watch said CDs, books and other personal belongings were confiscated from her parents’ house in Homs as well, and until this week, her parents were given no explanation for her arrest. Her family told Human Rights Watch that al-Mallouhi is in her last year of high school and belongs to no political groups. Syrian activists surmise she may have been detained over a poem criticizing Syria’s restrictions on freedom of expression. A photo of Gandhi greets visitors to her blog, to which she last posted on September 6, 2009. Several sources say her Arabic-language commentary addressed the plight of Palestinians. Numerous organizations have called for al-Mallouhi’s release, and her supporters have created Facebook pages in Arabic and English demanding she be freed. Amnesty International has joined the chorus of activists and watchdogs calling for Syria to release al-Mallouhi and says it worries the young woman is at risk of being tortured. “I'm going crazy. I have had chronic insomnia since my daughter's arrest. I survive on sleeping pills,” her mother told Amnesty last month. Amnesty fears al-Mallouhi is not only being denied treatment for her tachycardia, or accelerated heart rate, but that she may be subjected to any of the 38 types of torture and ill treatment Amnesty claims Syria has meted out to detainees. According to the Institute for War & Peace Reporting, the Syrian stranglehold over mainstream media has prompted young people, both inside and outside the country, to take to the blogosphere over sensitive social and political issues. Syrian authorities have recently cracked down on this brand of commentariat. Many bloggers use pseudonyms for fear of being jailed, and readership remains low because, according to a 2008 U.N. report, Internet penetration in Syria is about 17 percent. Syria is a secular state. It's not a fascist dictatorship, and has nothing to do with Nazism. Its citizens enjoy many liberties that are not enjoyed in other countries –considered "moderate"– this despite the authoritarian nature of its regime. And since political science is not a matter of opinion, I suggest you read a few books about Syria. Anything of R.A. Hinnebusch would work. I suggest his Syria: Revolution from Above (2001). I really think that instead of blogging about things that you don't know much about, maybe reading can be a better idea? or just write about things you've read more than a couple of media articles on.